Welcome Back! 2016 Season Update. We are looking forward to a new year here at the Tupelo Haunted Castle but before we get into all of the new attractions and events, we present to you the poster for the 2016 Season! For the 2016 year we are proud to announce the opening of a new property with TWO NEW EVENTS in addition to our award winning castle! Grab your friends and get ready for a year of scares, thrills and chills at The Tupelo Haunted Castle! We are back with a whole new walkthrough full of new scenes and scares! Come see why we are rated on the Best Haunted Expereinces in the South! Event Cost:$10.00/person or Get a Fright Package Ticket for ALL 3 events for $25.00/person! *see admissions for details. Group Discounts avail. see our pricing page. Navigate an everchanging labryinth where anything can happen! Lost In The Darkness is guaranteed to test your sanity! Please see admissions for details! WARNING: This event will push you to your limits! Alone In The Darkness is a solo-horror experience for individuals wanting the next level in scare. Experience true fear in our Alone in The Darkness event located at our new property! *Please Note: Alone In the Darkness requires a signed waiver from all participants, anyone under 16 will need a legal guradian to sign. For details please call (662)296-9164 or speak with our admissions staff at time of visit. Event Cost:$10.00/person or Get a Fright Package Ticket for ALL 3 events for $25.00/person! *see admissions for details.Group Discounts avail. see our pricing page. We appreciate your time and look forward to offering you the very best in haunted entertainment! Check back here periodically for updates and contests! Want some of the coolest horror merch around? Check out our friends at Terror Threads! Grab something and tell them we sent you over! Tonight is the night to make plans to attend this years Tupelo Haunted Castle! Over 15 scenes will greet each guests as they brave the haunt. From age zero to 100, we are the perfect family event! Tickets are on sale now! For questions or comments, please call 662-296-1751 or 662-871-2220! 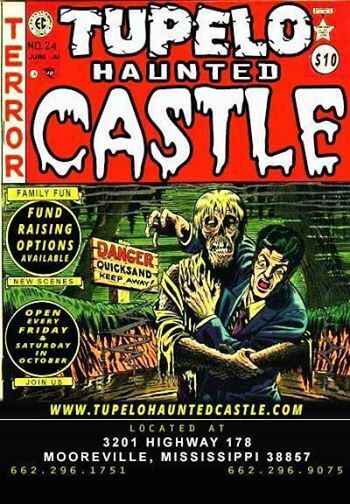 2014 Tupelo Haunted Castle poster! 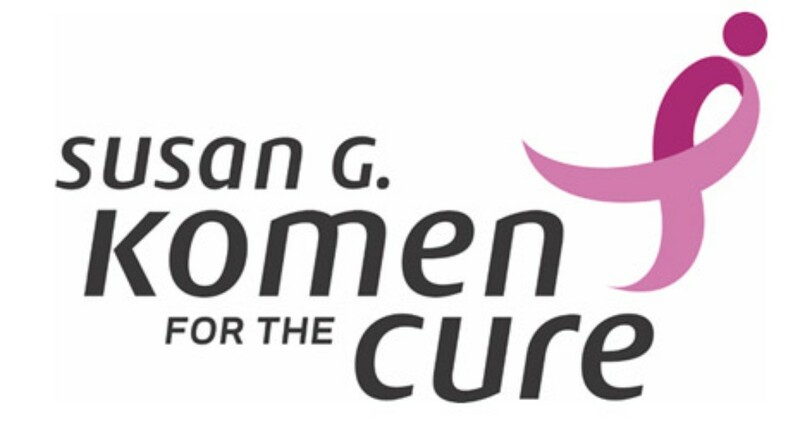 We are extremely excited to announce this year we will be doing a sponsorship night for the Susan G. Komen Foundation! Proceeds from this night will go directly benefit support and research helping end the struggle with breast cancer. November 1st we will open at 7pm and we encourage everyone to come out, get scared, or simply donate to this incredible cause! Help us turn the castle pink! Tonight is our second weekend and we have been hard at work redesigning several scenes in the haunted castle! Grab your friends and prepare for a night of thrills and terror! The show starts at 7! 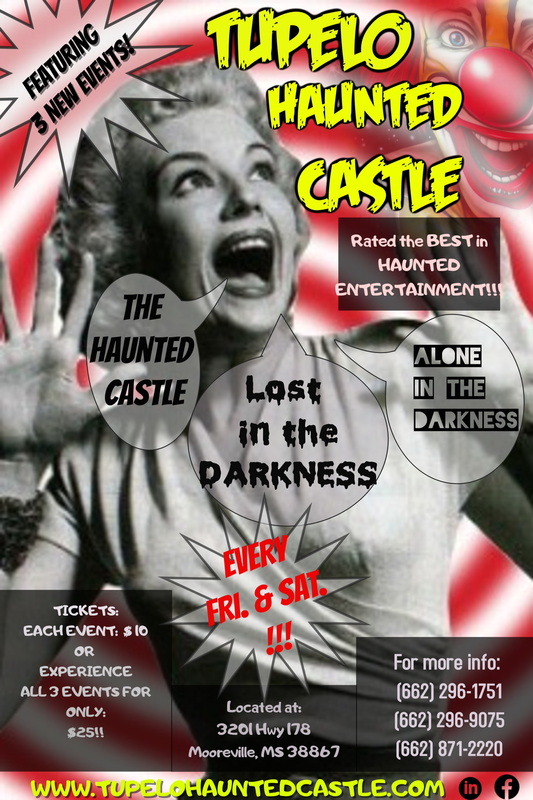 We are proud to present the NEW poster design for the 2014 Tupelo Haunted Castle! The 2014 season is closing in and we are hard at work! Continue checking for updates and contests! We look forward to a successful year at the Tupelo Haunted Castle and hope to see you there, if you can handle it that is!